2. Open the accumulator blowdown valve (H). 3. When the steam pressure drops to zero, close the coil drain valve (J) and the accumulator blowdown valve (H). 4. Open the circulating feed valve (E). 5. To resume operation, allow the plant to fill with water and start the burner in the normal manner. You may have to reprime the circulating pump after the blowdown. To prime the feedwater pump, refer to the manufacturer's instructions. When the electric motor is equipped with sealed bearings, the bearings are prelubricated for the life of the bearings. However, motors equipped with oil-wick-lubricated bearings should have 1 teaspoon of good grade oil added to the reservoirs every 6 months. If the motor is equipped with pressure grease fittings, remove the plug below the motor shaft every 6 months and force a light grade of grease into the port at the top until the clean grease appears at the plug outlet. To prevent rupture of the grease seals, run the motor for 4 or 5 minutes before replacing the plug below the motor shaft. Every year (more often under severe operations), drain and refill the water pump crankcase with a good grade of SAE 20 motor oil (about 5 quarts required). With the pump running, oil should show at least halfway in the sight gauge. The water pump check valves should also be inspected and cleaned when you remove scale from a restricted heating coil. Check the disks, springs, and valve seats for scale and pitting. 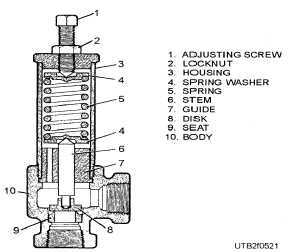 The relief valve (fig. 5-21) of the water pump should be adjusted to open at about 500-psi feed pressure but remain driptight during operation. Leakage from this valve results in a lack of water to the heating unit and causes overheating. Sometimes when the unit is started, the feed pressure may temporarily rise enough to cause the relief valve to release a small amount of water; however, the feed pressure will return to normal after the unit heats and the system becomes stabilized. The water pump discharge snubber (fig. 5-22) is nonadjustable. If the rubber insert has to be replaced, the old insert must be cut away from the retainer. To ease assembly, lubricate the new insert with glycerine (do not use oil) to allow it to be pushed into the retainer and bottom housing. Figure 5-21. - Pump relief valve. To keep the ring thermostat control of the generator (fig. 5-23) at peak operation, you may have to adjust the thermostat switch and the thermostat ring channel. The plant must be operated long enough to be thoroughly heated before you adjust the thermostat switch. In making these adjustments, refer to the manufacturer's instructions. Adjust the thermostat ring channel (Number 23 of fig. 5-23) when replacing the heating coil or if the original assembly has been disturbed. A careful check of the adjustment must also be made if the thermostat switch cannot be adjusted without erratic response. Figure 5-22. - Water pump discharge snubber.